The Cragganmore distillery was built in 1869-1870 by one John Smith (what's in a name, right?) who had previously been involved with the Glenfarclas, Macallan and Glenlivet distilleries. That wasn't his only claim to fame; John was the youngest son of George Smith who founded the Glenlivet distillery. John Smith's trustees continued the operation between 1886 & 1893, after which John's son Gordon took over as manager of the distillery. Cragganmore was rebuilt in 1902 and sold two decades later. 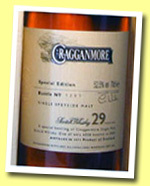 Cragganmore 12 years old Scotch whisky Cragganmore is Gaelic for great rock. John Smith ordered ... More on Malt Madness.